The entablature of room decor refers to the decoratiuve mouldings in wood and/or plaster ranging fromm the ceiling to the floor, and is based on the Greek order of temple architecture. Rooms and buildings follow a proportional approach based upon design disciplines formed in ancient times. Interior room of almost any period have some form of entablature (ĕntăb´lechoor; Latin, and tabula, a tablet) is : this is a classical architectural element, the superstructure of mouldings and bands which lies horizontally above the columns, resting on their capitals. It is commonly divided into the architrave, the supporting member carried from column to column, pier or wall, the part immediately above the column; the freize, an unmolded strip that may or may not be ornamented; and the cornice, the projecting and protective member. The Doric version of the entablature is fairly simple. The architrave, the lowest band, is split, from bottom to top, into the guttae, the regulae, and the taenia. The frieze is dominated by the triglyphs, vertically channelled tablets, separated by metopes, which may or may not be decorated. The triglyphs sit on top of the taenia, a flat, thin, horizontal protrusion, and are finished at the bottom of by (often ornate) decoration of drops, called guttae, which belong to the top of the architrave. The top of the triglyphs meet the protrusion of the cornice from the entablature. The underside of this protrusion is decorated with mutules, tablets that are typically finished with guttae. The cornice is split into the soffit, the corona, and the cymatium. The soffit is simply exposed underside. The corona and the cymatium are the principal parts of the cornice. The Corinthian order, however, adds a far more ornate frieze, divided, from bottom to top, into the cyma reversa, the dentils, the ovulo, the modillions, the fascia, and the cymna recta. The modillions are ornate brackets, similar in use to dentils, but often in the shape of acanthus leaves. The frieze is sometimes omitted - for example, on the portico of the caryatides of the Erechtheum - and probably did not exist as a structure in the temple of Diana at Ephesus. Neither is it found in the Lycian tombs, which are reproductions in the rock of timber structures based on early lonian work. The entablature is essentially an evolution of the primitive lintel, which spans two posts, supporting the ends of the roof rafters. The structure of the entablature varies with the three classical orders, Doric, Ionic, and Corinthian. In each, the proportions of the subdivisions (architrave, frieze, cornice) are defined by the proportions of the column in the order. In Roman and Renaissance interpretations, it is usually around a fourth of the height of the column. Most versions of entablature that do not fit these patterns are usually derived from them. In architecture the frieze is the wide central section part of an entablature and may be plain or — in the Ionic or Corinthian order — decorated with bas-reliefs. In a columnar wall it lies upon the architrave ('main beam') and is capped by the moulding of the cornice. In the interior of a room, the frieze of a room is the section of wall above the picture rail under the crown moldings or cornice. By extension, a frieze is a long band of painted, sculpted or even written decoration in such a position, above eye-level. These decorations often depict scenes, in an almost storyboard or animated sequence. An example of an architectural frieze on the facade of a building is the octagonal Tower of Winds in the Roman agora at Athens, which bears sculptures of the eight winds on its frieze. A pulvinated frieze is convex in section. Such friezes were features of 16th-century Northern Mannerism, especially in subsidiary friezes, and much employed in interior architecture and in furniture. This concept has been generalized in the mathematical construction of freize pattermns. In classical architecture the cornice is the set of projecting mouldings that crown an entablature. 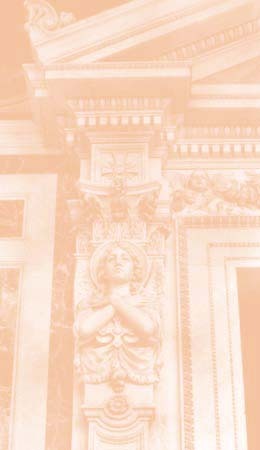 The cornice lies above the frieze, which rests on the architrave. The function of the projecting cornice is to throw rainwater free of the building's walls. In non-classical building practice, this function is handled by eaves and gutters, and in modern architecture the elimination of the cornice has been important enough, often simply for demands of style, that elaborate internal drainage systems are provided. A pediment is formed under the gable end of a building, where the cornice is carried across the wall at the height of the eaves and repeated above, under the roof line. The cornice, by extension. becomes any horizontal molded projection which crowns an element: the cornice of a door or window, for instance, or the cornice of a pedestal. A simple cornice may be formed just with a crown molding. In Italianate architecture, a cornice roof line is featured in most variants of this style. The term cornice comes from Italian cornice, meaning "ledge." The architrave (also called epistyle) is the lintel or beam that rests on thecapitals of the columns. As such, it is the lowest part of the entablature consisting of architrave, frieze and cornice. The word is derived from the French and Italian words arch and trabs combined together to mean "main beam". The word architrave is also used to refer to the mouldings (or other elements) framing a door, window or other rectangular opening. See also archivolt. the information on this page appears by courtesy of: http://en.wikipedia.org/wiki/Entablature the free on line encyclopaedia.